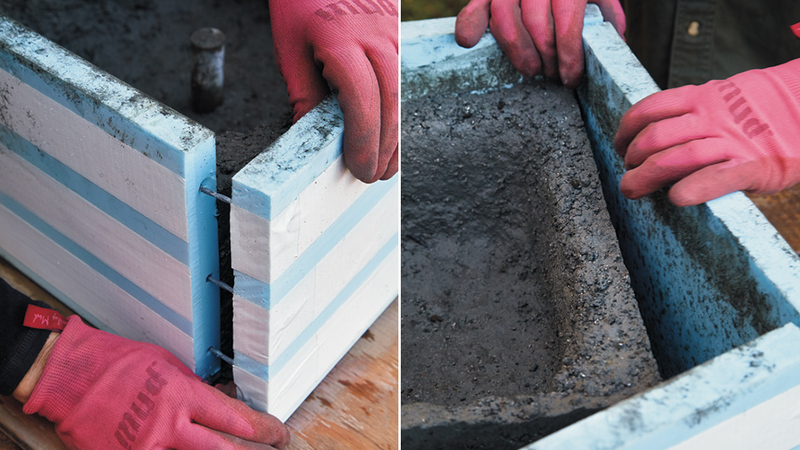 Make your own lightweight, stone-look planter with this simple DIY project. 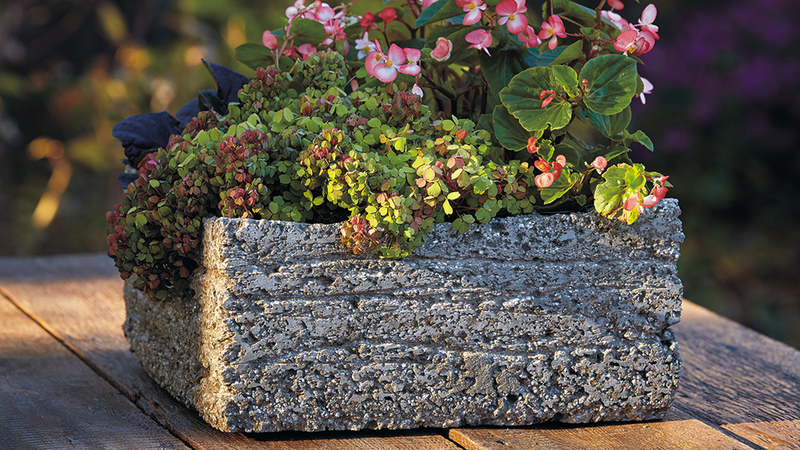 This hypertufa trough is perfect for container gardening and would be at home on any patio or porch. The rough, craggy surface of a stone trough provides beautiful texture on your deck or patio. The problem is that these gorgeous planters can be hard to find, expensive and very heavy. 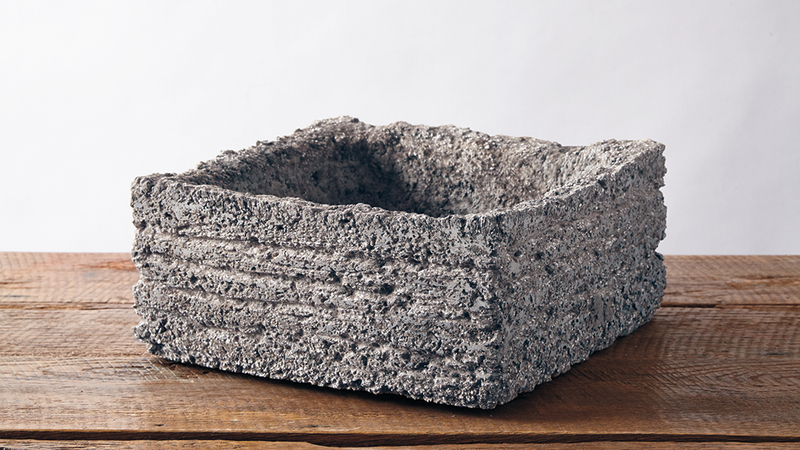 Instead of blowing your budget and your back, make a hypertufa trough like the one above. It gives you the same gorgeous look, weighs less and is a fraction of the cost. You can get all the materials in the list from the local hardware store. 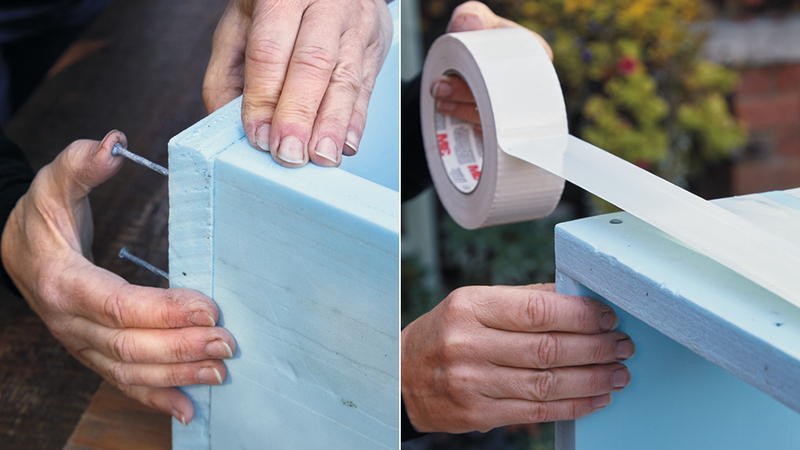 Follow along with the steps to make this 14-inch-square-by-6-inch-tall traditional trough. Then turn the page to see how to finish it off and find a few twists on hypertufa containers. 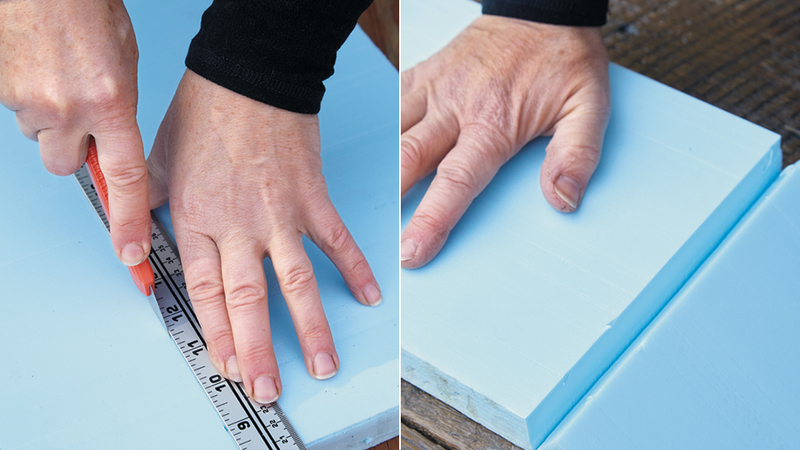 Forms are often made from wood, but this 1-inch-thick foam insulation board is easy to find and you can cut it with a craft knife. Measure the size you want. Here, the pieces were cut to form a 16-inch square about 8 inches tall. Scoring the foam is an easy way to get a clean, straight edge. Simply run the craft knife along the edge of a ruler, then set the foam on the edge of a table and push down to break it. With one end butting up against the other, push three evenly spaced 2¾-inch nails into the foam, catching both boards on all four corners. To help keep the form square, apply duct tape, pressing it firmly in place as you go. Repeat this near the bottom so you have two rows of tape. Set the form on a wood board — it’s sturdy enough not to break if you need to move it. There’s no need for a liner; the hypertufa won’t stick and it’s thick enough it won’t ooze out, either. 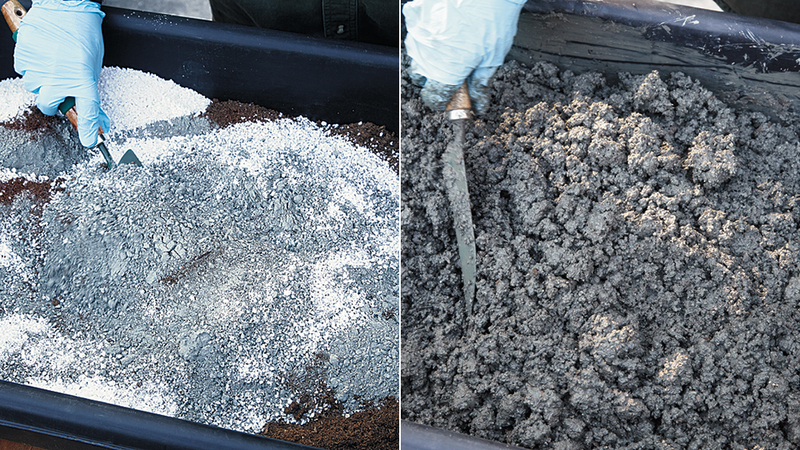 Wear plastic gloves and a mask to mix equal parts perlite, Portland cement and peat moss — for this trough, 20 cups of each material — in a cement mixing tray. Use a trowel to blend the dry ingredients thoroughly. 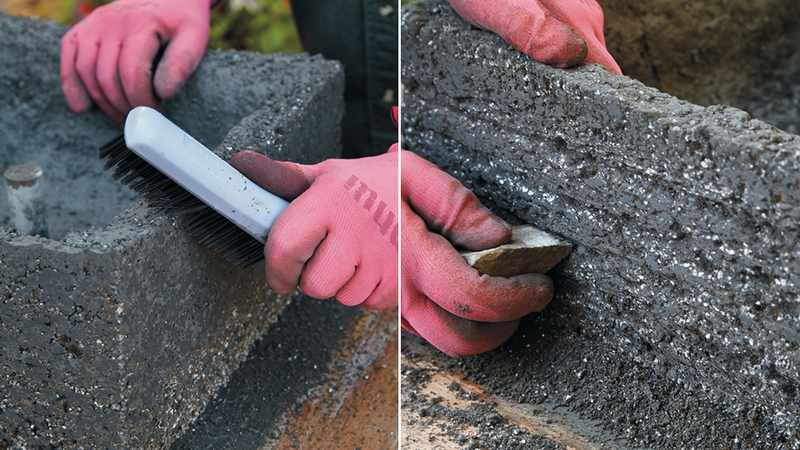 You don’t want unblended clumps of one material. Add water a little at a time so the mixture doesn’t get too soupy and work quickly so the hypertufa doesn’t start to set up before it’s in the form. You want a stiff consistency that stays upright on the sides of the form without slumping. Squeeze a handful of the mix in your hand — if it stays together without water oozing through your fingers, it’s ready to use. Take handfuls of hypertufa and apply it to the bottom of the form until it’s 1½ to 2 inches thick. Center a short wood dowel or piece of PVC in the bottom to create a drainage hole. Then start up the sides, patting the hypertufa firmly into place and making the walls the same thickness as the bottom. Be sure to work the mix into the corners so air pockets don’t form and weaken the trough. Once the walls are the height you want — this one is 6 inches deep — even out the edge then cover the whole thing with a sheet of plastic and let it sit out of direct sunlight for 24 to 48 hours. After 24 to 48 hours cut, the duct tape and pull the foam sides away from the trough. You may need to give a gentle but firm tug to break it free. At this point the trough will have hardened but can still be damaged by rough handling. Don’t forget to take the dowel out of the drainage hole, too. When you lift the plastic you may notice the hypertufa is still damp and may even be warm. That’s a normal part of the curing process. After the initial curing, hypertufa hardens but is still pliable enough to make a few changes. The foam boards created smooth outer walls. To add texture, use a wire brush to take the sharp edge off of the rim and corners, then a piece of stone along the walls to create deep grooves for that rough-hewn stone look. A screwdriver would work well, too. A slow, moist cure helps hypertufa harden and become stronger, so cover the trough with plastic again once the texturing is done. Set it in a shady spot or keep it inside where temperatures are moderate — around 70 degrees F is ideal. Too cold, and all that moisture will freeze and crack; too hot, and it will get dry and brittle. Check under the plastic occasionally, and if the trough is faded in color or feels really dry, use a spray bottle to mist it before covering it back up. After a month, you can uncover and start using your trough. Portland cement has a slightly higher pH but it shouldn’t be a big deal for the plants. If you’re concerned about that, you can let the trough sit outside to get rained on or hose it down daily for a couple more months to be sure the lime has washed away. 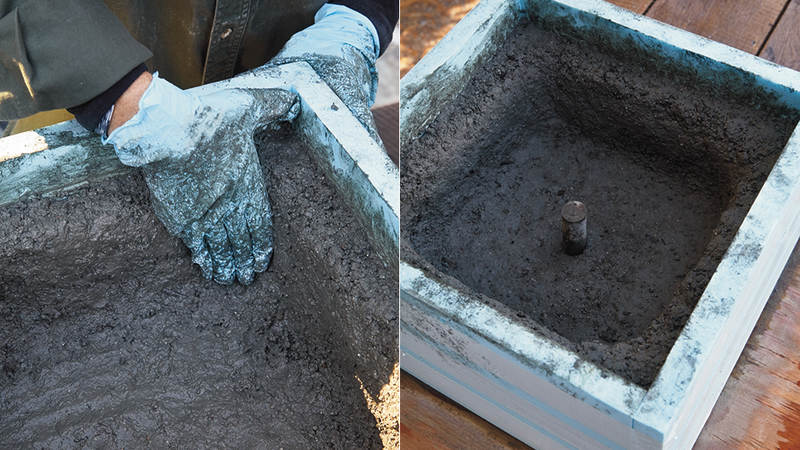 Here’s the finished product: a 14-inch-square-by-6-inch-tall trough. It’s not unusual to find bits of peat moss sticking out here and there on the surface. They’ll wear away over the season, or you can get rid of them right away with an old toothbrush. Plant whatever you want in your trough as long as it suits the size of the container. Where winters get below freezing, bring the trough inside so it’s out of the weather. 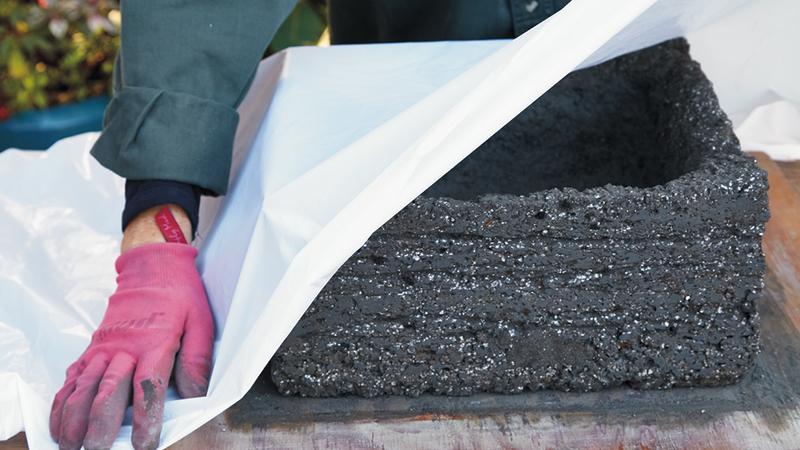 Moisture from snow and rain will accumulate in all the textured spaces, freeze and thaw and cause cracks that will shorten the container’s lifespan.